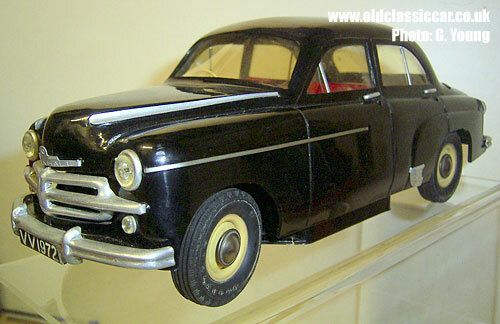 Background info on this neat motorized car. 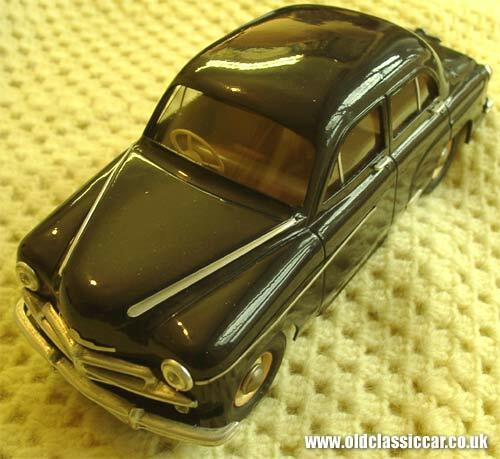 Alan has quite a collection of plastic toy cars, including these rare examples of an early 1950s Vauxhall saloon. "My favorite make of model, Victory Industries. 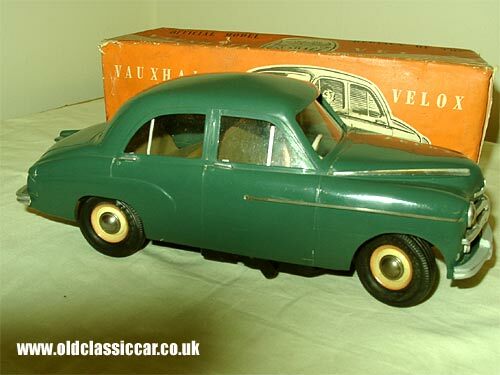 The green toy is one of their early models of the Vauxhall Velox, brought out circa 1953. Plastic body and chassis with batteries in recess in floor, powered by the famous 'Mighty Midget' motor. With steerable front wheels and aluminium trim, length 10 inches by 4 inches wide." "The other Victory Velox, dark blue this time, is the later variant with more detail than the other earlier green one. 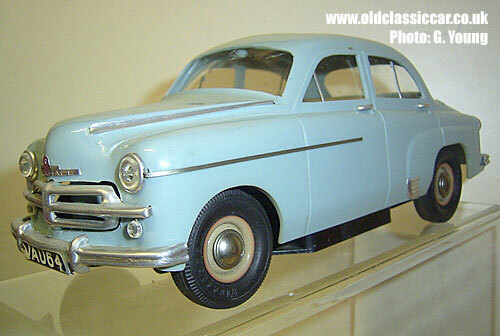 This later toy car was made in various colours including ivory, light blue, dark blue, red and grey." "Finally the car shown from the rear quarter angle - apparently this doesn't exist but it does! - there were two Victory Veloxes as already mentioned, the early type with moulded rear lamps and no. plate VV 1972, and later more detailed with no. plate VAU 64. The car shown in the final photo is the later type with early no. 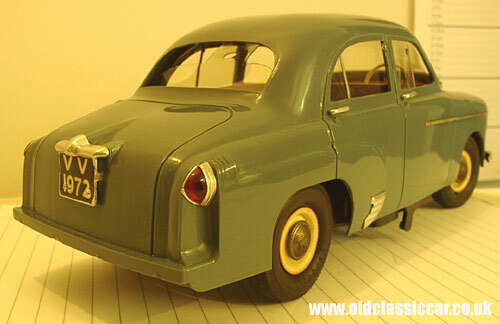 plate and judging by its steering wheel [ early type] was probably made in 1953 when the new model was just being introduced with some leftover transfers." 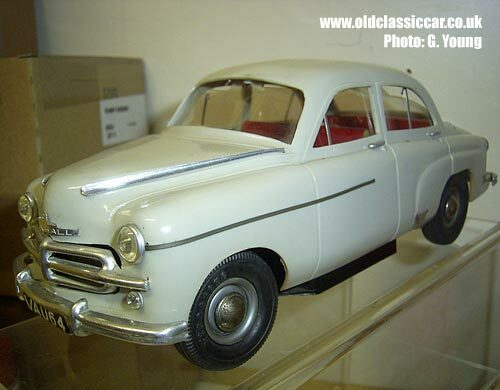 Some time ago, Alan forwarded over a selection of images kindly taken by Graham, a fellow collector of Victory Industries toy cars. 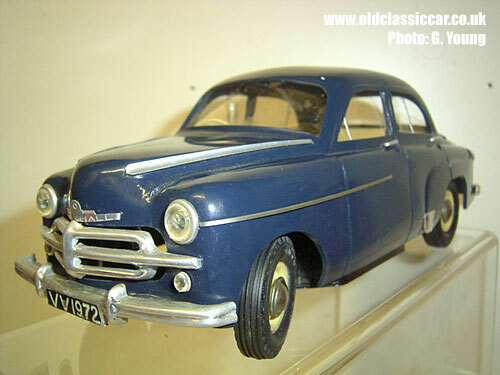 He has several examples of the Vauxhall Velox in his collection, and attached photographs of a light grey and a black example, plus light and dark blue versions also. Thanks to both Graham and Alan for sending them over, they're now shown below.